Freelancing is blooming with the nature of work we all are involved in; studies and business. Hard workers always follow some common grounds: determination, steadfastness and ability to meet deadlines. Furthermore, there is an array of skills based on the interest for freelancers ensuring the capabilities to thrust themselves to the subjective field of interest. What we all have seen is the fact that even when we put in our efforts, we don’t land on the perfect jobs. Ever wondered what makes it difficult? According to the expert freelancers, it is all about the execution and projection of our plans. Determining the goals and objective should be the first step to plan and execute entire thought. Naturally, if you will jot things down for your own referrals, it is going to smoothen the work process. For example, if at the back of your mind it is $500 which you have to make monthly, then planning has to be more accordingly. Actually, what I suggest to my fellow freelancers is to plan everything for more than $500. It is because of two prime reasons: what if something which you planned doesn’t work out and/or it loses its value in the market. Being a freelancer for more than ten years, I got to know the standing of bidding with a realistic approach rather than idealistic one. When we bid on a project, send business proposal or approach the client for work purpose, we need to survey the market. It is imperial because, in that way we can always find the market value. This market survey strategy ensures the freelancer that he is not paid less. He can make a decision wisely. As a noob and enter the freelancing, it gives an idea of what other people are charging against the work assigned. You can charge less to give it a push to get your first five projects. Plan everything for the upcoming week. What I personally do is to write a diary of what work is most important to think deadline and which tasks can wait. According to the paperwork, I plan it for the week. If this tip is followed, the workflow is systematic and organized. Cloud computing is a leading trend in the current freelancing and entrepreneurial activities. There are a number of software which is free of cost, however, at times you may need premium paid tools. Choose appropriate tools to serve the purpose of the expertise. For example; if you are a blogger and have Adsense site, you may need tools to dig high click per cost (CPC) keywords. Or, if you go for freelance photography, the digital camera should have all those features to strengthen and boost the result of any picture. Always start off with a free tool to check out its functionality and use in freelancing. But, if you feel it’s worthy enough then it should be bought. Practice and keep it going!! Let’s say you are a web developer and are a newbie. Practice enough on your own, make your own blogs, see how it works. Once you are sure of the grip over the technology and mechanism, move on to the next level. Start working for a client. Progression is in human nature. Never leave a setback until it! Utility of social media is in trend to exhibit more about your business and services you offer. Facebook, Twitter, YouTube and LinkedIn are some platforms where the prospects of meeting potential clients remain open. You can always work with local or international clients. Although, social media is a good strategy to get a kick start in freelancing business, spamming promotional posts isn’t a good idea. Allies are the perfect combination of work with mutual friends. They are those people who spread word related to your expertise and business, helping you climb the next rung of the ladder. Social media is mostly used in connecting people with your friend’s relative or friend who want his/her work done. Proposing something which can help the client and getting a favor is a common exercise. Nevertheless, bringing clients to your way is not a big deal nowadays. Freelancing or being an entrepreneur sounds as if you work 12 to 14 hours every day. Yes, according to many it is more like being a slave to yourself but it isn’t so. Why? Because, it is all up to you to govern its stay in your life. Maintaining personal life with professional (let it be freelancing or small scale business) harmonizes life. Let’s say you have official timings from 8 am to 5 pm then let it be. Don’t do anything personal during this time slot. Likewise, don’t do anything related to work after that time. Giving time to loved ones, being around nature and caressing your soul is much more important to keep you sane and working. Once you are a freelancer, the prospects of vulnerability towards the finances every month is quite variable. Even when you are making good money and the freelancing is going super smooth, it’s better to save for rainy days. Also, try not to take loans from other people when it comes to professional growth and stability. Keep a good eye on the dealing of money matters. Pay taxes and re-schedule your plans and agendas after every 2 to 6 months. Send invoices regularly to the clients, fix dates for the clearance of dues and keep monetary dealings straight. Official websites always give a professional look to draw attention of clients. Legit clientele are mostly built on the sites. For that, you have to make sure of certain elements: Logo and banner are eye-catching, services which are offered are written in easy, simple English promoting your work done for others in the sample section and payment methods. Moreover, you should have a business card for new clients. Think out of the box and remain original in ideas. Office and necessary gadgets are really essential to get new clients. Make the working station more authentic in terms of its need. Another factor is of operation. You can always use one of the rooms in your house to work as a freelancer. Make it your office and bring every feel to connect with the nature of work. Always make sure that the work which you have taken is as important as of others. Say no to more work if you can’t meet the deadline because of existing workload. It is not going to be fair on your or clients’ part to take work, and face consequences once the expectations of the client are overlooked. Always take a small amount as down payment. This keeps the client tied and you are a freelancer doesn’t need to fret about the payments. This leads to trust and confidence in each other which grows with time. Here are some more tips about getting paid as a freelancer. Every proposal should be written and not done verbally. It saves you from misunderstandings which are not healthy for professional growth. When everything is written and is signed by the client and freelancer, less chances of going against the words are expected. If you want to keep freelancing as your only way of making a living, then you have to make sure that the growth of it is recorded. If you make $1000 in the first month of the year and $780 in the second, you should be able to know what were the mistakes and strengths. Knowing your business inside out plays a dynamic role in its progression. 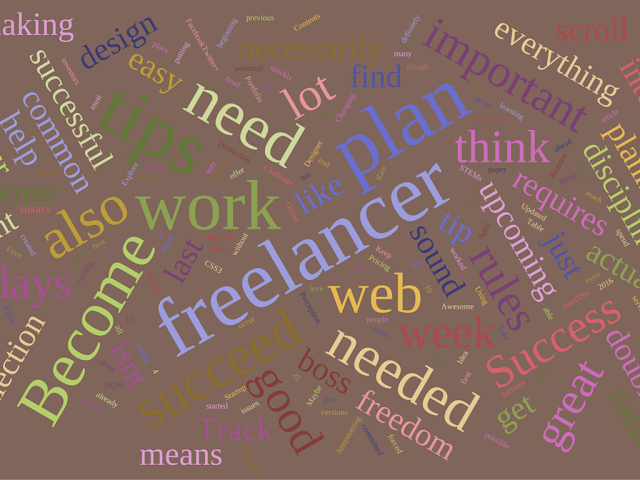 There are many other tips which you might love to know or actually implement for successful freelancing. However, these are some of those which I see happening in my freelancing career. Every freelancer is designed differently in nature. Some may like few tips and other may have an absolutely new take on these tips. Nevertheless, amateurs need to understand the basics of freelancing which include; planning, keeping finances clean, record progress over time, get paid and clear dues to your associates on time and create an environment where you would actually love to go and work. Updated on December 2016 : Added more tips and fixed minor issues. Umer Adil, a seasoned author providing guest post services. Mainly, his prime focus is on write-ups related to web hosting reviews, tip and tricks, etc. This article is also depiction of same.